Maximizing Progress: Megaboston ~ Radical 1912 Vision for Hub City! 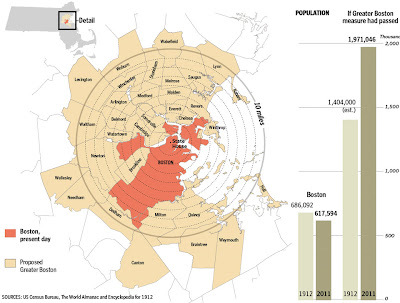 "Could Boston have become one of the world’s megacities? [...] that was the ambition of a Brookline lawyer named Daniel J. Kiley, who [...] submitted a bill to the Massachusetts Legislature that would have totally transformed the city, swallowing every municipality within 10 miles of the State House to create a unified “Greater Boston.” Kiley’s bill proposed bringing 32 cities and towns -- from industrial centers like Malden, Waltham, and Cambridge to leafy burgs like Wellesley, Lexington, and Nahant -- within Boston’s borders. At some 327 square miles and with a population of 1.4 million, the huge new megalopolis would have been larger in area than New York City, Chicago, or Philadelphia."